Please note that we will be closed on Sunday 21st, we will however be open on Monday 22nd 11am to 4pm. 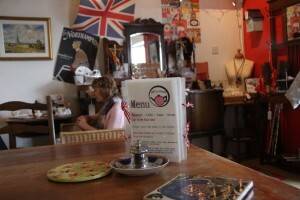 The ARTea Room is a traditional licensed vintage tea room with friendly service, serving a range of loose leaf teas in vintage bone chine cups and saucers. There are always a range of delicious freshly baked home made cakes to choose from, Victoria sandwich and coffee cake are firm favourites and ever present on the cake counter. If tea is not your “cup of tea” then we can offer cafetieres of coffee, cappuccino, café latté, Americano or café mocha with as many extra shots of coffee as suits your preference. If, on the other hand, you are looking for something cool and refreshing we have a range of soft drinks and fruit juices on offer, as well as a small selection of real ales from the Frog Island brewery in Northampton. For a lunchtime bite to eat we have a delicious range of sandwiches, toasties and jacket potatoes with a choice of fillings to suit every taste. We also have a range of hot pots available served with either a rustic roll or in a giant Yorkshire pudding. For smaller appetites there is also a delicious home made soup on the menu. Many of the sandwich and potato fillings are suitable for vegetarians and should gluten free be appropriate for you we always have gluten free bread and there is always a gluten free cake option on the cake counter. Cream teas are always available with a choice of scones, clotted cream, strawberry jam and fresh fruit added to a pot of tea of your choice. If all of the above is too much choice then why not book an afternoon tea? This comes with a generous supply of finger sandwiches, cream tea with a choice of scones and a choice of cakes from our cake counter, add to this is a choice of cakes from our cake counter or for that special occasion the option of a glass of sparkling wine is available when pre-booked. 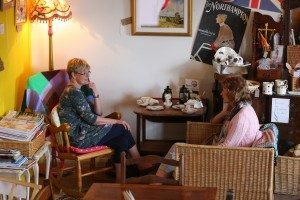 While you are enjoying your refreshments there is plenty of local art work on display and for sale, so at The ARTea room there really is something for everyone! ARTea Room is at ARTea Room.